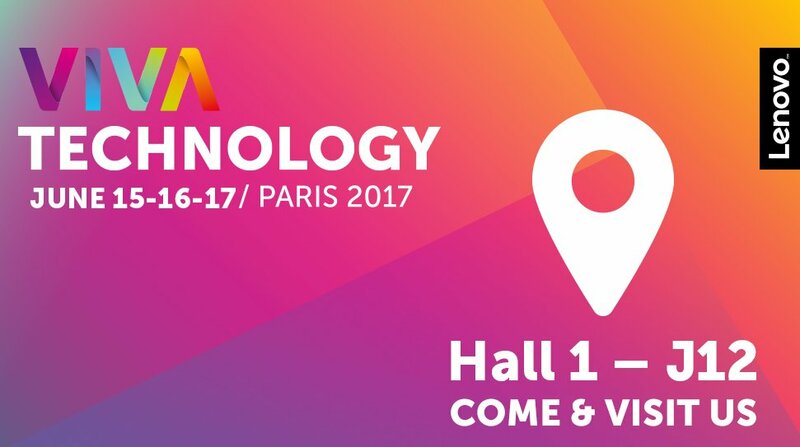 Building on the success of its partnership with VivaTech 2016, Lenovo will return for a second year with a major presence in 2017. It will offer a host of activities including keynotes, conferences, live product demos, innovation showcases and launch an exciting start up challenge on Motorola technology. On its booth, Lenovo will showcase a wide ranging line-up of its most innovative laptops, tablets, convertibles, detachables and smartphones, offering the general public interactive product demos and hands-on experiences. It will also hold thematic sessions on the hottest technology trends and host experiential activities to demonstrate customers’ real-world applications of some of Lenovo's greatest innovations. VivaTech 2017 will host participants from over 200 countries and is expected to surpass last year’s 50,000 visitors, including 5,000 startups, 7,000 CEOs and 1,000 investors. Committed to diversity in the workplace, Lenovo’s Executive Director of EMEA Communications, Catherine Ladousse, attended a panel on June 15th with experts to debate on new ways to attract women to science and technology. She will also moderate a session on “Why and how to attract and keep women in STEM (Science, Technology, Engineering, and Mathematics)” on June 16th at Lenovo booth, sharing best practices from Lenovo and other companies like Orange and Engie, that are committed to close the gender gap (#womenrock, #peoplematter). Throughout the course of VivaTech Lenovo will be offering sessions with experts every day on Augmented Reality and Virtual Reality, Cloud and the data center business, and the Moto Mod Developers Kit. In these sessions Lenovo experts will offer their vision on what Cloud represents for Digital Transformation (evolution or revolution?) and explain the steps creators can take in developing their own reference Moto Mods (Moto Mods snap easily onto any Moto Z phone and transforms your phone into an entirely new device: a super-zoom camera, a boombox, a projector and more). Finally, French start-up Wosomtech, winner of the Phab 2 Pro Tango Start-up Challenge with Google at VivaTech last year, will run a “Meet-up session” to demo the Augmented Reality application it has developed to run on the Lenovo Phab 2 Pro as a result of the challenge. Easybuild app offers a quick and easy way for architects, engineers and real estate, retail and interior design professionals to measure, map and redesign any interior. Users can scan real interior environments, generate 3D maps and 2D floor plans, design an augmented reality for interior spaces and then upload everything onto the cloud. Motorola’s “Transform the Smartphone” challenge encourages developers, startups, and other creators to harness their creativity to imagine smartphone features that have never been possible and come out with the best ideas for new of Moto Mods. Moto Mods snap easily onto any Moto Z phone. They fit perfectly and securely to transform your smartphone and provide users with unlimited possibilities. The concept of the Moto Mods is simple: they can be just about anything you can dream up. Whether it’s a film projector, a top-of-the-line speaker or even a blood pressure monitor – the possibilities are endless. On June 16 the five top Moto Mod proposals of the “Transform the Smartphone” challenge will be chosen at VivaTech by a jury led by Motorola Chief Marketing Officer, Jan Huckfeldt. Each of the five top teams will receive the Moto Z and Moto Mods Development Kit to create their prototype and mount a crowdfunding campaign with IndieGogo. The final winner will be invited to present their Moto Mod to a group of executives and developer teams at Motorola Mobility’s Chicago headquarters, and they will be considered for the worldwide accelerator program.